Swiss design comes to the fore with this stunning metric test indicator made by TESA in Switzerland. It is only available in metric. What sets these apart from their cousins is the brilliant metallic red bezel and bright white dial. 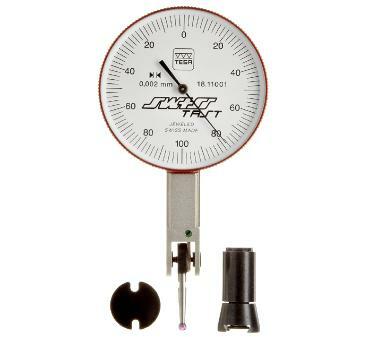 When you are in need of a metric test indicator, there will be no long searches. Red is the bull's eye. Additionally, they come standard with ruby contact points. They may not yet be in the Metropolitan Museum of Art's collection of outstanding designs, but they deserve an honorable mention. SwissTast in a plastic case, with a ruby contact point, a contact point wrench, and an 8 mm mounting stem that attaches to any of the three dovetails on the indicator body. Should you ever need repairs, you will be able to use any TESA BesTest part interchangeably. We even have a repair manual if you intend to give it a try yourself. Otherwise, any qualified repair shop (such as Long Island Indicator) will be able to help. (*) The internet discount applies only when the order is placed online from this web page. The list price applies if you need to use a purchase order (subject to approval). Note that in some instances, the model numbers are printed in different formats. 01811000 and 01811001 are occasionally encountered.